another amateur food blog (toronto) | restaurant reviews from the trenches. Hodo Kwaja (http://hodokwaja.ca/menu/) is a cute little Korean bakery that makes madeleines and waffle cookies, and also makes walnut cakes and Korean pancakes right in front of your eyes. Clearly this is a bakery run with passion, and according to their website they use no preservatives. Watching a skillful woman make Korean pancakes was a very enticing experience– seeing the dough kneaded and then flattened on to a sizzling cooktop, only to brown to a lovely golden colour. Well…if you’re me, Korean baked goods in general, it appears. We ordered 6 walnut cakes ($2) in all 3 flavours, as well as a Korean pancake with cinnamon/sugar/peanut filling. My friend and I did not even want to finish them– which is a complete non-event when we go out to eat. I think it must be that the ingredients are just not things I particularly enjoy, nor do I consider healthy– e.g. corn syrup, sugar, margarine, potato powder…the bland, starchy sweetness is just not my style. I wish I loved it, though, because this place seems like a very worthwhile place to support. Check it out for yourself! Hi! There is the first restaurant stop on my attempt to systematically visit all the Korean restaurants in Koreatown– and I’d say it was a good start! The restaurant itself is tiny and cash-only. The menu is huge, with stews, stir fries, fried rice, and of course regular and hot stone bibimbap (the latter $8.99 with a variety of toppings including shrimp, squid, bulgogi beef, chicken, veggies, and kimchi & cheese). Upon arrival, our server gave us a friendly greeting (can you guess what it was?) and brought everything with a smile and a quick explanation of what things were. The bibimbap came with a delicious assortment of veggies (the mushrooms were particularly good) and shaved bulgogi beef (not ground beef, a pet peeve of mine). The bowl was sizzling although I didn’t get the best crust on my rice. The banchan was quite good and generously portioned- kimchi, pickled cucumber and radish, salted bean sprouts, potatoes in sweet sauce, and what looked like cold jap chae. If I could have 6 things of pickled radish I would. But I’m not complaining. They also served miso soup that was very heavy on the miso, so quite salty. Overall, Hi! 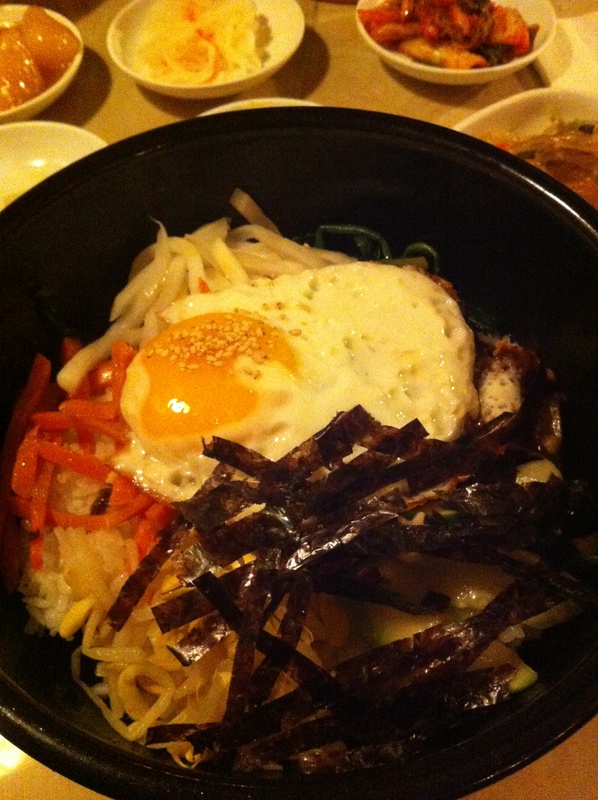 There satisfied my bibimbap craving at an affordable price. I felt quite smug when I walked by Ka Chi (Korean food for white people, just a few stores away) and saw the same menu item for $13.95. I am obsessed with neapolitan pizza. On that count, Napoli Centrale did not disappoint- the pizze oozed tradition and the crusts were perfection. We ordered a margherita (my standard benchmark of comparison) and a napoletana (sausage/rapini/fior di latte). The margherita had a lovely sauce (although I find the traditional sauce lacking a little oomph), that perfect soft melty fior di latte cheese, 2 leaves of basil (apparently sparse basil is a thing…why?) and a crust that didn’t sag in the middle (hallelujah). The napoletana was not for me…I have solidified that I don’t like rapini because I find it unpleasantly bitter. The sausage was also a bit bland, making the overall pizza leave something to be desired. The sangiovese house wine was warm and quite serviceable. In terms of ambiance, I think I’d like to sit near the oven at the back on a cold day. We were at the front by the open windows (which was nice), but I just wasn’t getting the feel I was hoping for. That wasn’t helped by our waiter, who was really nice but certainly did not lend any “traditional” cred. I think I’d like to give Napoli Centrale another try when I’m craving pizza (but NO rapini!). The price point is as good or better than other places, and the quality is impressive…no wonder it’s getting rave reviews! I definitely enjoyed their banchan (side dishes), their crispy, tasty seafood pancake, the generous portions, the family atmosphere, and the prices! The bibimbap wasn’t my favourite I’ve had- the vegetables were a bit lacklustre and the rice didn’t get as crispy as I’d like. But overall it was a good experience. Mengrai Thai started off great. I called to place a take-out order, and the guy on the phone was friendly and helpful, repeating back my order, confirming any allergies, and telling me it would be ready for pickup in 15 minutes (quick!). I arrived a tiny bit early and was graciously seated and offered a complimentary glass of wine. I was pleasantly surprised when my order came that the food was so affordable: original pad thai and regular pad thai with chicken and shrimp (each $10.95), spring rolls ($3.75) and salad rolls ($2.75). However, things went downhill from there. Despite my clear instructions that I was allergic to green onions, both orders of pad thai contained liberal amounts. The vegetarian spring rolls were very freezer-to-frier, and the cold rolls were bland and chewy. Both were served with a generic sweet-chili sauce. The regular pad thai was the reddish, sweet, saucy kind, and honestly wasn’t that bad compared to others I’d had, but just wasn’t amazing. The original pad thai had a weird oily flavour and the fish taste was too strong for me. Overall, the word “gourmet” in Mengrai’s name is pushing it to the extreme as far as the food quality is concerned.